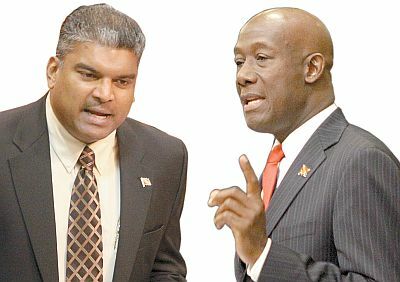 The AG like he gone from starring in Clear and Present Danger to acting in The Good, the Bad and The Rowley! An& beginning to worry me with this passion he has for The Keith. At every opportunity this man has he riding Keith backside on the same issue over and over. The last time a man ride me on an issue so, well...that is a different blog! On what grounds is the AG calling out the Leader of the Opposition to a debate on Hanging? Is this another red herring they waving to distract the population from the fact that they doing nothing? Why isn't Parliament good enough to have the debate in? 8 days into February, we have 4 murders, and a toll of 44 for the year thus far. This latest victim is the witness to a crime. So 2 crimes likely to remain unsolved now...a brutal assault and a murder. WHERE IS THE CRIME PLAN? And with all this probing, nothing getting resolved. Sat claiming victory on Sita's transfer...not so fast, let she accept it first. People up in arms about the Jamaat School getting State Funds...is a terrorist organisation people saying....what is Sat? Sat's version of terrorism and discord just as dangerous and more insidious. If the Madressa in Mucurapo forms a legal education body then it is just as entitled the Catholics, Presbyterians, TIA Muslims, Hindus and Anglicans! It take several children to dead, but finally the Children's Bill has been re-tabled. Like Glen take a break from Wedding Planning! George Singh who exploiting chutney artists for years want to sue the Alternative to Chutney aka Kuchoorla! And crime still rampant! De Vice Cyah Done!